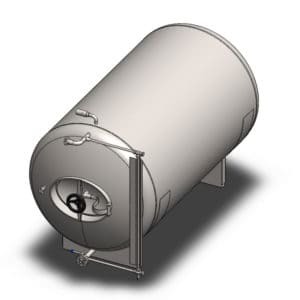 Horizontal non-insulated pressure vessels for production of beer, cider or wine. Cooled by air. The maturation tanks (also named “lagering tanks“) are used for the maturation of the beer, cider or wine. The drink is finalized and carbonated by activity of the remaining yeast. The serving tanks (also named “”bright beer tanks”) are used for preparation of the finalized beer, cider or wine before their filling into kegs, bottles or other packages. 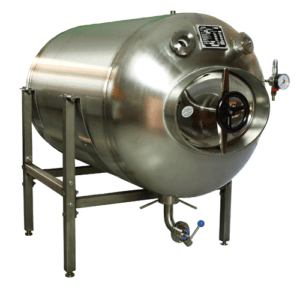 These pressure tanks are also necessary for cleaning drinks from the remaining yeast – filtering or pasteurisation. The storage tanks (also named “draft beer tanks” or “dispensing tanks”) are used for storage and pressurizing of the drinks before their dispensing to glasses in the bar or restaurant. These special tanks are equipped with the plastic bag for separation of the drink from pressure air. Therefore there is possible to draft the drinks using only pressurized air without contamination of the drink without the risk of product contamination.